Core Conditioning: What does it mean? More often than not, the word “core” is used synonymously for six pack abs. 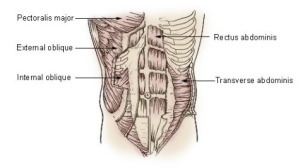 In reality however, your rectus abdominus (abs) merely make up a small portion of your core. The core is actually a group of muscles. The main job of these muscles is to stabilize your hips and spine. Yes, those wing-like muscles under your armpits (lats) are part of your core. The latissmus dorsi muscle actually originates below your shoulder and attaches to your hip and along your spine. A strong and stable core helps you keep correct posture and aids in the efficient transfer of energy and power to your extremities. Due to its stabilizing role, a strong core will also help prevent injury during any bending or twisting. The vast majority of everyday movements or sport specific motions involve your core. It is also where most of your power originates. Think of a football player in the defensive line pushing his opponent back. He must have strong shoulders, arms and chest in order to out-muscle his opponent right? Well yes, but in order to use his arm strength he must have a strong core so that he’s able to direct his power forward without being set off balance and stood upright by his opponent. For more of an everyday example, think of yourself walking on an icy road. All of a sudden you slip and loose balance. Your core muscles will immediately tense up and bring your upper body forward again to regain balance. If your core is strong enough that is. Otherwise you might have an unpleasant encounter with the ice. Hopefully I was able to convince you that core conditioning is important and you are now pumped and ready to get your core in shape. Before you get started though, it is extremely important that you use proper form and keep your back straight at all times when you are training you core. If you are unable to perform the exercise correctly, just chose a simpler one and work up to it. Here are a few ideas for great core workouts ranging from beginner to advanced. - Plank: The plank is a great isometric core workout. Get into a push-up position and then drop down onto your forearms. Make sure your body is completely straight (like a plank) and hold for as long as you can. To make it easier, try it on your knees and to make it harder, lift one foot off the ground and hold it up for 2 – 5 seconds and then switch. - Olympic Bar twists: This simple exercise will really target your obliques. Stand up an Olympic bar with its bottom end approximately 3 feet in front of you. Hold it near the top of the grip area with your arms straight in front of you. Now twist your arms and torso slowly to one side and then back. Make sure your arms stay straight and you are always following the bar with your head. Repeat for the other side. - Jackknife on ball: Get into a push-up position with you feet on a ball. Now roll the ball forward using your feet on it so that you knees almost tough your chest. Then roll it back .repeat. - Inverted Mountain Climbers: Get into a push-up position with your feet on an exercise ball again. Now slowly bring your left knee forward and touch you left wrist, always making sure your back is completely straight. Repeat other side. To make this one harder, bring your left leg underneath your body and point it out to your right. Bring your foot back onto the ball again and repeat other side for one rep.
- Squats: Squats are a fantastic exercise for core strength if performed correctly. If you are not completely confident that you are performing squats with correct form, please seek assistance from a certified trainer. Otherwise this exercise can end up doing more harm than good. Some things to watch out for when performing squats are, a tight core, slightly arched back (under no circumstance should your back bend forward), knees always behind your toes and think of it as sitting back into a chair. Watch this video that shows you a properly performed squat. - TRX Workouts: The TRX is a very versatile piece of equipment that costs between $150 and $210 depending on the kit. You can get a whole body workout with it and it will fit easily into any gym bag. Every exercise performed with the TRX (if performed correctly) works your core. You are always required to keep you body straight while using the TRX, since there are no benches or seat-backs supporting you. These are just a few examples of good core exercises. If you are interested in finding out what else you can do to get a strong core, come visit your nearest Fitness Town location.